As you may know, my current poll has do to with chips. I heard a while back that you can enhance any vegetable casserole with a topping of crushed potato chips and drizzled melted butter. And I found it to be true! And what about Cheetos? I'll bet they would make a good crust on any casserole. A few years ago I saw on one of the local news channels a segment on how to make a super easy cornbread dressing for Thanksgiving. It had Fritos in it!!!! I (and Will and Laura) gave it a try. For the Fritos Cornbread Stuffing Recipe, click that. I'm really thinking that ANY crunchy thing (crackers, tortilla chips, etc.) would make a good topping for a casserole. And any crunchy sweet thing (like cookies, sweet cereal) would be good crushed and spread on, say, cheap vanilla ice cream. On this food note: I've known people who like to 'enhance' cheap pizza slices by dipping them in Worchestershire Sauce.... and/or Ranch dressing. I know my clever blog readers have some clever tips for enhancing all kinds of regular foods. I'd love for you to share if you'd like! If you haven't taken my chip poll please do (upper right - totally anonymous). On a TOTALLY different note, the handsome fella in the right picture in my header (if you're reading this post the time it was posted), who is holding a dear little Andrew, has a birthday Friday. That's Cap with his dear Grandmother. Happy Belated Birthday to Cap!! I don't know why nobody has commented on this blog post because the topic is interesting and delicious. I was hesitant to share what I have to share but I just will anyway. In prison and county jail, we had awful food, bland, tasteless and totally lacking in nutrition. And Im pretty sure you are thinking....as it well should be.... I agree. We wouldn't want people committing crimes just to get a good meal, Right? Although, nutition may be a good compliment to rehabilitation...should that be a choice by an inmate. At any rate, this is what I want to share...we had commissary if we were lucky enough to have money put on our account. Commissary sold vitamins, tuna fish, V-8 juice and few other healthy choices in addition to what we called hygienes. BUT, it was the various chips and cheetos we could buy that gave us FLAVOR for which we craved. We were able to buy a hot pot, where you can heat up water. 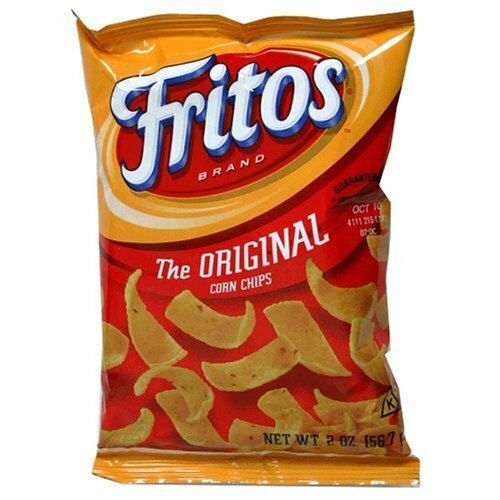 We would crush flavored potato chips, add a little bit of crushed cheetos,and a bit of water and a small amount of crunched pork skins (to get the bacon flavor). Roll up the potato chip bag full of the above ingredients, secure it with rubber bands and cook for a couple hours...it would give you the best baked potato. I was quite surprised! Another thing we would make is tamales. 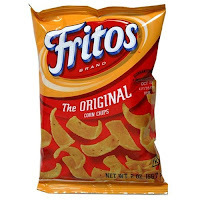 By crunching up red hot fritos, then add a small amount of water. To that add crunched up cheetos (for cheese) and a bit of chili or tuna and you'd get delicious tamales. The amazing and creative Hispanic ladies would actually role these into perfect tamales...the rest of settled for the the mishmash flavor of tamales (think of it as a casserole). Heating it up as in recipe above. Then there was the cake! You take sandwich cookies. Separate the inside frosting from the cookie. Crunch up the cookie, add a little water and cocoa (if you like chocolate) or instant coffee (if you prefer that flavor). Then mold it into a cake - round or square. Next, take the frosting and mix it with peanut butter and a bit of syrup (saved from breakfast). It is the best frosting! Frost the cookie cake with it. Heavenly! Go ahead, try it at home. I won't tell! These recipes go on forever. I'll stop here. Seriously, if you have college kids in a dorm and all they can have is a hot pot, their possibilities are really limitless. Look at it as an experiment. Get creative and have fun! I may have to blog about them. And I was surprised that nobody (but you) commented on this post! But you made up for their lack!!!!! I figured this post would be full of comments...I was shocked when I got here today. I had been debating rather to add my 2 cents. The fun thing about these cooking projects we did in there...it brought us women together as we did these things together, sharing ingredients and taking turns crunching stuff. Built community among us, I suppose like women since the beginning of time. We used to kid around about publishing a recipe book when we were released. I'll bet it has been done, it was a big part of the culture. And, when we received the monthly newspaper (about 8 pages), written by inmates from all the locations (men and women), there was always a couple recipes published.